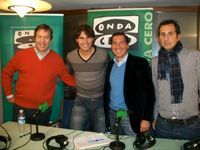 Santi Segurola, Rafa Nadal, Angel and Paco Muñoz. from facebook profile here.Twitter here. 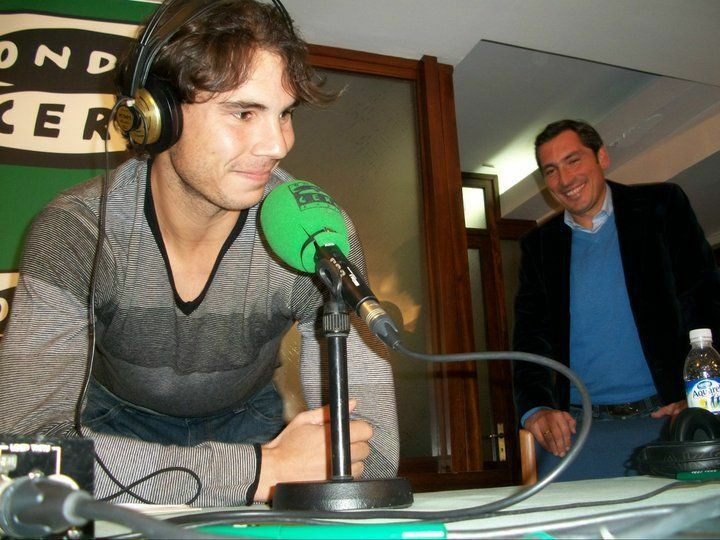 Rafa is broadcasting form his home In Manacor! 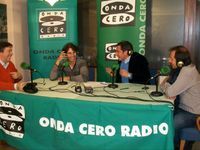 MADRID - The Spanish tennis player Rafael Nadal, world number one, refused to assess the Operation Greyhound against doping, which is splashed with renowned Spanish athletes, but regretted that these situations generate "doubts" over other athletes. "The clearest case is cycling constantly emerging cases. It does tremendous damage to the sport and creates doubts about the other athletes. Accountant I wish it clears. Is a friend of mine and I wish him well and I think him. 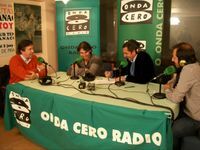 All this is terrible for others, "said Nadal in the" first touch "of Onda Cero . "If we reach the square of Manacor, which is five minutes here, and arrive at four doping and without drugs in five, get five but we get there. And if we all do the same, everyone arrived in five, This competitiveness will be the same, "said the Spaniard. "On the Operation Greyhound as it is not resolved, just as in accounting, and I can not say. They talk about things that are not settled or tried. To me, this is very complicated. I do not like being behind" , said Nadal. "It is true that running a very hard Tour but instead is running in five hours, it runs in seven. Or instead of putting stage of 300 kilometers, put 150. But what can not be is cheating," said the number one of world tennis. As the year ends and it will end with the Spanish player to the top of the circuit, Nadal gets "high marks." "I am very demanding of myself, but obviously has been the best season of my career and I played my best tennis," said the Spanish, who now thinks the first Grand Slam in 2011, the Australia Open. "A bit scary to think that if I win in Australia would close the circle of four Grand Slams in a row, but what's scary is that I have already won three straight. Right now my feeling is that I'm training and playing pretty well, but until Australia any anything can happen. I will not deceive you, for me is a big illusion to get there and try to play well and compete to reach the finals and once you're there anything can happen, "he said. "Yes it's true it's an opportunity, it might only, to win four straight because I am not Rod Laver did it twice. The truth is that it is a unique opportunity but make no mistake is a tournament and as always I will face it to get well prepared and every day that goes on the track trying to do well, "said Nadal, who is set to qualify for the Masters in London, with the eight best in the world, as an initial goal for the year. "My first year's target is to be in the Masters in London next year (which is the last tournament played). Then we'll see what happens. If I'm in London Master of my season will not have been bad because I will be among the top eight and that is only available to eight. From there my goal is day to day, "said Nadal, who insisted his criticism of the calendar to which players are subjected. "The timing is very bad for the players focused. The schedule favors to have short careers. It's a big mistake that people do not help guide the sport to be more long races. It's something that should change. We played with too much tension because it is marked by the telling of the rankings and how to approach every tournament. We play from 3 January until November 30 without stopping, "said the Spaniard. Nadal came out in defense of the athlete and criticized the attitude of the International Olympic Committee for the little "prize awarded to athletes for being in the Olympics." "Winning in Beijing was a beautiful moment and you also realize that the effort involved for all athletes. We are lucky that we have a spectacular track, the basketball players or have the same luck but there are many athletes living on the edge and all you have is the illusion of the train each day to reach the Olympics, "she said Nadal. "I think a great injustice that since the International Olympic Committee so little reward athletes who make all that effort and give the maximum to win medals is a grant. I think it would have to pay much more than what paid the Olympics. " "And I repeat, to say nothing for myself or for the players or players because luckily we have designed life perfectly, but for everyone else because the IOC itself a veritable fortune to win the Games and the least we could do is reward to all those athletes who make the sport continues to be big, "said the racket of Manacor. Nadal also talked about football and the Golden Ball, to be unveiled early this year, but said the Argentine Leo Messi on the other. "It's this year you have to win a Spanish, but Messi is extraordinary. I have seen Maradona videos. Live've seen little, but from what I've seen to Romario I loved, I Ronaldo and Zidane loved, I love Cristiano Ronaldo. But this guy is something special, it's amazing not only for what he does but by how it does, "he said of Messi.